An Agenda to Keep Your Meeting on Track - PENCO Management inc. Starting your agenda early allows you to solicit feedback before the meeting. This can help prevent mistakes and add details that might get overlooked. It is important to distribute the meeting agenda to the Board of Directors Members at least 5-7 days in advance of the meeting so that they have a chance to review the agenda and any relevant information concerning topics on the agenda. 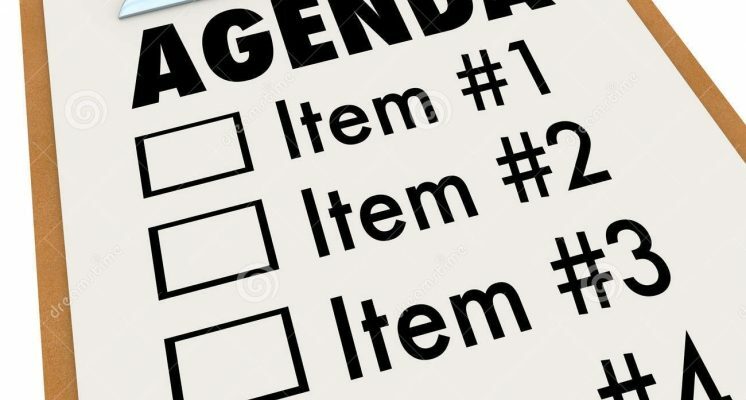 The title should contain the word “Agenda” and what subject matter the agenda will cover. “Community Meeting” or simple and direct titles are usually best. Remember, the purpose of the agenda title is to inform readers of what they are viewing. Include the date, time and location of the meeting. Add a sign in sheet to list the attendees if the meeting is open to the general membership. A proper agenda should start by calling the meeting to order and recognizing a quorum. The conclusion of the meeting should include a proper adjournment and scheduling of the next meeting date. Next write a brief statement describing the meeting objectives. This statement should only be a few sentences including the goals for the Board of Directors to accomplish at the meeting. Meetings without a clearly defined objective waste precious time deciding what to talk about as opposed to addressing the topics themselves. After defining the meeting, create an outline of the discussion items. The outline will be the guide to keep everyone on topic and the meeting progress on a productive course. You should always schedule the most important items first just in case the meeting runs out of time. During the meeting keep a record of the amount of time spent on an item and make sure the discussion stays on topic. This will insure an efficient and constructive meeting. Proofread for errors and completeness before distribution. Going through this review reflects in a positive manner on your attention to detail and the respect you have for the attendees. that meetings that have continued for more than one hour often become unproductive as restlessness and inattentiveness set in among the participants. In order to keep everyone cordial and productive, make sure your next agenda is properly prepared by following the tips previously discussed.